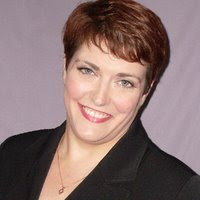 Kaye Dacus likes to say she writes “inspirational romance with a sense of humor.” She lives in Nashville and graduated from Seton Hill University’s Master of Arts in Writing Popular Fiction program. She is an active member and former Vice President of American Christian Fiction Writers (ACFW). Her Stand-In Groom novel took second place in the 2006 ACFW Genesis writing competition. Her thirty-fourth New Year and still no kiss at the stroke of midnight. . .or any other day or time. Meredith Guidry stood in the doorway leading into Vue de Ciel—the cavernous, sky-view event venue at the top of the tallest building in downtown Bonneterre, Louisiana—and swallowed back her longing as she watched hundreds of couples kiss. A short burst of static over the earpiece startled her out of her regrets. “Mere, we’re going to set up the coffee stations and dessert tables.” The executive chef’s rich, mellow voice filled her ear. She clicked the button on the side of the wireless headset. “Thanks, Major.” Turning her gaze back to the main room, she tapped the button again. “Let’s slowly start bringing the houselights back up. I want us at full illumination around twelve thirty.” She strolled into the ballroom, the floor now covered with shiny metallic confetti, the hundreds of guests milling about wishing each other a happy New Year. Out on the dance floor, a large group of men stood swaying, arms about shoulders, singing “Auld Lang Syne” at the tops of their lungs, accompanied by the jazz band. She kept to the perimeter of the room, doing her best to blend in with the starlit sky beyond the glass walls, barely repressing the feeling of being the loner, the schoolgirl no one else paid any attention to. . .the woman no man ever gave a second glance. Meredith’s heart thumped at the sudden voice behind her. She turned. Major O’Hara grinned his lopsided grin, his chef’s coat nearly fluorescent with its pristine whiteness. “How’re you holding up?” He squeezed her shoulder in a brotherly way, his indigo eyes gentle. Anne. Meredith’s cousin and best friend. Her inspiration and mentor. Owner of a stellarly successful wedding- and event-planning business, Happy Endings, Inc. And friends with Major O’Hara on a level Meredith could never attain. “Yeah, I guess so. I’m glad we convinced Anne to fall in love with him. Finally, having another man’s opinion when we’re all working an event together.” He winked. Meredith quickly turned her eyes toward the milling crowd so he wouldn’t see how he affected her. It would only embarrass him—and mortify her. Over the next hour, Meredith poured herself into her work to try to keep exhaustion at bay. The last few guests meandered out just after one thirty. Meredith turned on all of the lights, their glare on the glass walls and ceiling nearly blinding her. She tasked her staff to stack chairs, pull linen from tables, and clear the room. She directed the sorting of the rented decorations and materials into different dump sites around the room. Early Tuesday morning, she would meet all of the vendors here to have their stuff carted away so the building maintenance staff could get in for a final cleaning before resetting the room for lunch service. “Miss Guidry, are these your shoes?” Halfway across the room, one of the black-and-white-clad workers held aloft a pair of strappy, spike-heeled sandals. Meredith’s medium-height, pointy-toed brown pumps rubbed her feet in a couple of places after six hours—but nothing like the pain those sandals would have caused. “Lost-and-found,” she called over the music throbbing through the room’s built-in PA system. Not what she would choose to listen to, but it kept the staff—mostly college students—happy and working at a brisk clip. That made three pairs and two stray shoes, five purses, sixteen cellular phones, and one very gaudy ruby ring—and those were only the items Meredith had seen herself. Her assistant would be fielding phone calls for days. Vacuum cleaners roared to life—a wonderful sound as it meant they were getting close to quitting time. A couple of guys loaded the last of the large round tables onto a cart and wheeled it down the hall to the freight elevator, followed by several more pushing tall stacks of dark blue upholstered chairs on hand trucks. Vue de Ciel expanded in all directions around her. She hugged her arms around her middle. She’d survived another New Year’s Eve Masked Ball—and the eight hundred guests seemed to have enjoyed themselves immensely. Hopefully her parents would deem it a success. The soprano of flatware, alto of china, tenor of voices, and bass rumble of the dish sterilizers created a jubilant symphony that thrilled Major O’Hara’s heart. Simply from the questions the food-and-wine columnist from the Reserve had asked, the review in the morning newspaper wouldn’t be good. It would be glowing. “Chef, stations are clean, ready for inspection.” Steven LeBlanc, sous chef, wiped his hands on the towel draped over his shoulder. Though Steven’s white, Nichols State University T-shirt was sweat-soaked—much like Major’s own University of Louisiana–Bonneterre tribute—the kid’s blond hair still stood stiff and tall in mini-spikes all over his head. Major hadn’t yet been able to find anything that would keep his own hair from going curly and flopping down onto his forehead in the heat and humidity of a working kitchen. Yet asking Steven for hair-styling tips—Major grunted. He’d rather slice his hand open and stick it in a vat of lemon juice. He followed Steven through the kitchen, inspecting each surface and utensil, releasing some of the staff to clock out, pointing out spots missed to others. “Civilian in the kitchen,” rang out from one of the line cooks. Meredith, stately and graceful, light hair set off to perfection by her brown velvet dress—like strawberries served with chocolate ganache—swept into the kitchen, drawing the attention of every man present. If she knew she had that effect on his crew, she would laugh her head off and call them all nuts. “I’m ready to release my staff, unless you need any help in here.” Meredith came over and leaned against the stainless-steel counter beside him. She even smelled vaguely of strawberries and chocolate. . .or maybe that was just his imagination. “See?” He grinned at her. Meredith nodded and departed. Major rounded up the last few stragglers and watched them run their cards through the computerized time clock. Returning their happy-New-Year wishes, he ducked into his office at the rear of the kitchen, grabbed his dry-cleaning bag along with his duffel, turned off his computer and light, and locked the door. The brass nameplate winked in the bright kitchen light. Major O’hara, Executive Chef. He grimaced. What pride he’d taken eight years ago when Mr. Guidry had offered him the position—saving Major years of working his way up the chain of command in restaurants. He heaved the two bags over his shoulder. Meredith’s parents had been better to him than he deserved, had given him the flexibility in his schedule to take care of family matters no other employer would have given. They had also given him their blessing—their encouragement—to strike out on his own, to open the restaurant he’d dreamed of since working for Meredith’s aunt in her catering company throughout high school and college. The restaurant he’d already have, if it weren’t for his mother. Major shut down the houselights, guilt nipping at his heels. Ma couldn’t help the way she was. The mirrored elevator doors whispered shut, and he turned to stare out the glass wall overlooking downtown Bonneterre from twenty-three floors above. His descent slowed, then stopped. The doors slid open with a chime announcing his arrival on the fifth floor. Before he could turn completely around, Meredith stepped into the elevator. Meredith shook her head. “No.” The simple answer held a magnitude of surprise. “Of course it’s safe. You lived in New York too long.” She walked out past him. Meredith blushed bright red and dropped her gaze. “Look, I don’t mean to alarm you. But in this day and age, anything could happen.” He kept hold of her a moment longer, then let go and readjusted the straps of the bags on his shoulder. “Watch football.” He winked at her over his shoulder as he approached her Volvo SUV. The tinted windows blocked him from seeing inside. Perhaps he had lived in New York too long. But Bonneterre had changed even in the eight years he’d been back. Crime rates had risen along with the population. And he would have done this for any other lady of his acquaintance, wouldn’t he? He heard the lock click and opened the driver’s-side door for her—taking a quick peek inside just to make sure that the boogey man wasn’t hiding in the backseat. “Oh, honestly!” Meredith playfully pushed him out of the way and, shaking her head, opened the back door and heaved her large, overstuffed briefcase onto the seat. “Hey, who died and made you my keeper?” Meredith laughed. He closed the car door and waved before walking over to Kirby, his beaten-up old Jeep, a few spaces down. As he figured, Meredith waited to back out until he was in with the engine started. He followed her out of downtown and waved again as they parted ways on North Street. A few fireworks flickered in the distance against the low-hanging clouds. He turned the radio on and tuned it to the Southern Gospel station. Always keyed-up after events, he sang the high-tenor part along with the Imperials. Though it had taken him a while to build the upper range of his voice—having always sung baritone and bass before—when he, George Laurence, Forbes Guidry, and Clay Huntoon started their own quartet, Major had been the only one who could even begin to reach some of the high notes. Sometimes it was still a strain, but he practiced by singing along with the radio as loudly as he could. . .to keep his voice conditioned. The phone flashed a confirmation that the message was sent, and he holstered it. Grabbing his black duffel from the back, he left the orange dry-cleaning bag to drop off at the cleaners Tuesday. To blow off some steam and try to relax enough to fall asleep, he turned on the computer and played a few rounds of Spider Solitaire. About an hour later, his whole body aching, eyes watering from yawning every other minute, he grabbed a shower before turning in. At thirty-eight years old, he shouldn’t feel this out of shape—of course, if he still made time to go to the gym every day and didn’t enjoy eating his own cooking as much as he did, he probably wouldn’t be this out of shape. He weighed as much now as he had playing middle linebacker in college. . .except twenty years ago, it had all been muscle. But who trusted a skinny chef anyway? Thunder grumbled, and rain pattered against the window. Major kicked at the comforter that had become entangled in his legs during the night and rolled over to check the time. Eight thirty. What a perfect day to don ratty old sweats, sit in the recliner watching football on the plasma TV, and eat junk food. If he had a plasma TV. Or any junk food in the condo. Alas, though, he’d promised Mrs. Guidry he would drop by. Best check the schedule of games, see which he cared least about, and make the visit then. He pulled on the ratty old sweats and an equally ratty ULB T-shirt, though. As he passed down the short hallway, he tapped the temperature lever on the thermostat up a couple of degrees to knock a little of the chill out of the air. His stomach growled in concert with the thunder outside. The tile in the kitchen sent shockwaves of cold up his legs. Shifting from foot to foot, he yanked open the dryer door, dug through the clothes in it, and found two somewhat matching socks. Sometimes having the laundry hookups here did come in handy, even though they took up more than a third of the space in the small galley kitchen. The fridge beckoned. Not much there—maybe he should hit the grocery store on the way back from the Guidrys’ open house. Half an hour later, with the Rose Bowl parade providing ambiance, he sank into his recliner and dug into the andouille sausage, shrimp, potato, mushroom, red pepper, onion, jack cheese, and bacon omelet spread with Creole mustard on top. Maybe he should consider making a New Year’s resolution to cut back on calories this year. What was missing? Oh, yeah, the grits. He’d left the bowl sitting by the stove. Halfway to the kitchen to retrieve the rest of his breakfast, the phone rang. He unplugged it from the charger as he passed by. Major stopped. So did his heart. How would you feel if everyone around you seemed to be dating someone? What if you have loved someone secretly for eight years and he just isn't showing any sign of interest? The main character, Meredith Guidry, deals with these issues in the 2nd book in the Brides of Boneterre series by Kaye Dacus. Meredith is a character that many women can relate to. She is getting older, watching friends and family around her getting married and starting families, and she has yet to see her wish for love come true. Major O'Hara, her love interest, puts up walls because he is afraid to let anyone know about his mother who suffers from a mental illness. Both spend much of the novel harboring feelings for each other, but not expressing them out of fear. You may find yourself cheering them on and telling them to just spill the beans already! I truly enjoyed reading this novel! Even though I didn't read the first book in the series, Stand In Groom, I was able to easily follow the story and get to know the Guidry family. The backdrop of the restaurant and catering business was very enjoyable. And who doesn't love romance mixed in with some really great food? I definitely would recommend this book to any Chick Lit fan! 1 comment on "FIRST Wild Card Tours: Menu For Romance by Kaye Dacus #Sponsored"